Our Vision: To reveal and elevate God’s presence through beauty, creativity, and relationship. Our Mission: Create a space for women to cultivate beauty, creativity, and relationship in a uniquely feminine and authentically Catholic way. "they sow fields and plant vineyards and get a fruitful yield. By His blessing they multiply greatly..."
Hello Beauty, a Catholic Creative Retreat for Women! When we behold beauty, we encounter the presence of God. Creativity allows us to get to know God, the ultimate creator. The Lord brings us into relationship with Himself and others. I gotta tell ya - God is good. I remember being so so so nervous before this interview. I mean, I'd never met Jennifer. I had only a vague idea of what we'd be talking about, so I compiled pages of notes to cover my bases. Pages, you guys. I had notes about GIVEN 2016, Scatter and Sow, my business, and quotes from Saint JPII and Pope Francis and Von Balthasar...notes everywhere. Erin and I even did a practice run a few nights before to make sure I hit some key points about the retreat and how Scatter and Sow came to be. And then we talked and I gotta say, it wasn't really what I imagined. I didn't even look at my pages of notes once. But here's the thing... Just minutes after the call, I literally had no idea what I'd said or talked about. But more than that, I remember feeling like God was there, speaking through me and saying things He wanted someone to hear. I felt good, because it was so evident that God is good. Here's another confession, though: as time went on, I forgot about that tingly goodness-y feeling and convinced myself that I'd probably said something odd or embarrassing. Or that my voice probably sounded weird. So I didn't listen to the recording of the interview - for MONTHS - until yesterday. Holy Moly, you guys, God was good and is good. I (He) said some really good stuff in there!! Jennifer and my conversation ran the gamut - we touched on creativity, self acceptance, comparison, offering up weaknesses, and yes, we talked about GIVEN and the Scatter and Sow initiative. I'll be honest- it got kinda got real...in a good way. I hope you'll take a listen to hear more about why Scatter and Sow exists, why Erin and I went to GIVEN, but more than that, to maybe hear a little jewel of truth that God wants to speak to your heart. 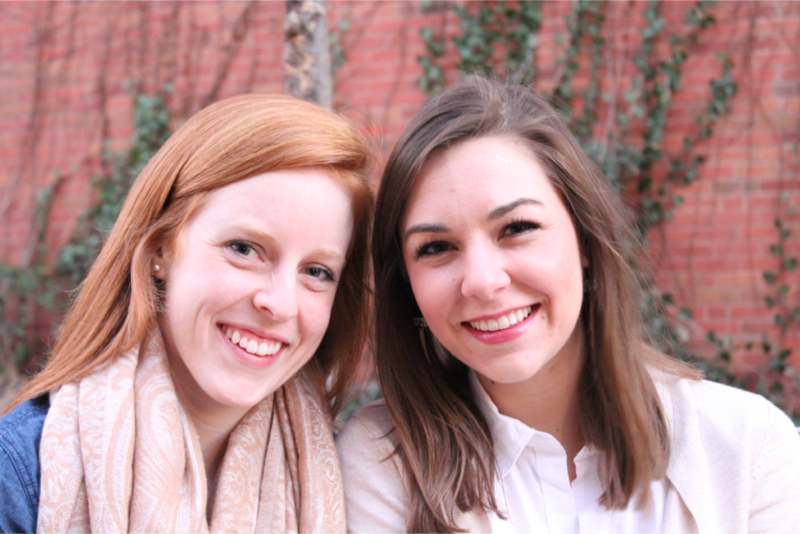 Fast friends, Erin and Tara met through a church women's group. They share a fondness for exploring creative outlets as a means for seeking beauty and growing in their Catholic faith. Both have a passion for helping women get to know their worth and see themselves as God sees them. Scatter + Sow is a manifestation of that passion. Erin Day (left) is first and foremost a daughter of God, blessed with the honor of being a wife, mother, daughter, sister, and friend. She grew up in Littleton, Colorado, and attended the University of Northern Colorado where she earned a bachelor's degree in communication studies. Erin went on to be an academic adviser in the Gaylord College of Journalism and Mass Communication at the University of Oklahoma. Erin is co-founder of Scatter and Sow, where she continues to grow in her creative endeavors. She lives in Ontario, Canada, where her husband is stationed for the United States Air Force. Tara Forth (right) is the owner and artist of Frameworthy Designs, where she makes stationery, event decoration, and commissioned art. Hailing from Jenks, Oklahoma, Tara attended the University of Oklahoma, graduating with a bachelor’s degree in advertising. Professionally, Tara has worked in graphic design, development, and public relations. She is based in New York City and works at Sesame Workshop, the nonprofit force behind the beloved children’s show, Sesame Street. Tara is the co-founder of Scatter and Sow.